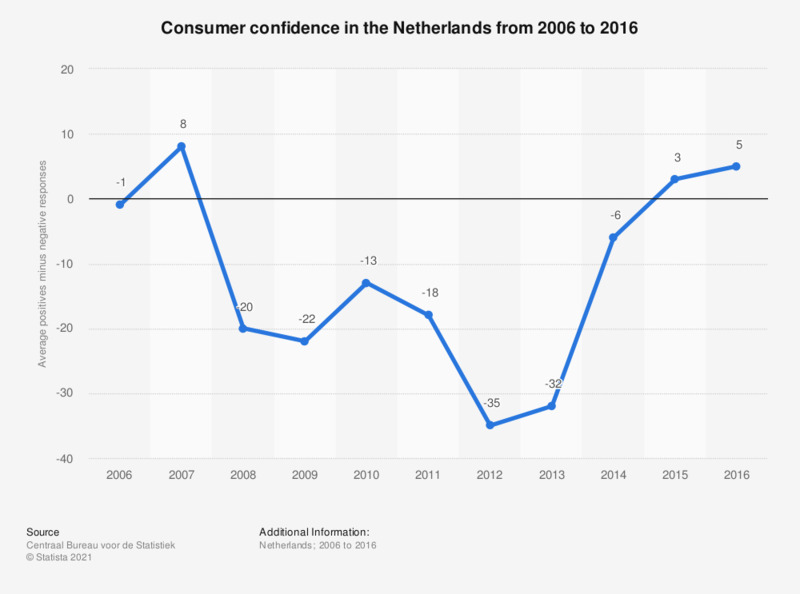 This statistic shows the consumer confidence in the Netherlands from 2006 to 2016. In 2006, negative responses regarding the Dutch economic situation outweighed the positive replies, leading to a negative consumer confidence of -1. The source adds the following information: "Consumer confidence is the balance of positive and negative replies as a percentage of the total, per month. The consumer confidence survey provides information on confidence and expectations of consumers regarding the developments of the economic situation in the Netherlands. Each month the consumer confidence survey asks approximately one thousand respondents five questions concerning the economic situation in general and their own personal financial situation. Positive and negative answers are possible. Subsequently, the number of positive and negative answers to each of the questions are totalled." The source adds: "Consumer confidence is calculated as follows: the first step in calculating the index is to convert the frequency distribution of the scores for each question into a percentage." distribution. Subsequently, for each question, the percentage falling into the response categories 'clearly better' and 'slightly better' (henceforth: Pp) and the percentage falling into the response categories 'slightly worse' and 'clearly worse' (henceforth: Pn) are aggregated (unweighted). The consumer confidence index is the average of the balances of the positive (Pp) and negative (Pn) replies to five subquestions, expressed as a percentage. The indicator ranges from -100 to +100. If the value of the indicator is zero, the number of pessimists and optimists is the same. Thus, neutral answers and the response category 'do not know' are not taken into account.